Gulab Jamun is my favorite dessert. I used to make it for every festival. I make it with the box mix which worked fine for me so never really thought about trying from scratch. This Diwali I wanted to try it from scratch and remembered seeing Gulab Jamun in Sangeetha's space. So decided to give a try. It was a huge success- the shape, the color, the texture and the taste everything scored A+. When the syrup is still warm, add the fried jamuns and let it soak for atleast 2- 3 hours. For the size I made(smaller compared to the usual size), it yielded 36 Jamuns. If you do not have milk mawa powder, you can use regular milk powder too. Add just the right enough milk to knead. Add the milk little by little(one tablespoon at a time) The dough should be soft, smooth but not sticking in the hand. The temperature of oil is very important, if it is too hot then the jamuns will burn when the inside is still uncooked. So keep a check on the temperature while adding every new batch. You can also garnish it with pistachios, almonds or shredded coconut to make it more interesting. Beautiful and perfect, That is spirit you didn't give up. Yumm. They have come out perfect...what is milk mawa powder? any particular brand u are using..can I use normal milk powder instead? Milk mawa powder is khoya powder. I got it from the Indian store here. It was not a branded one.. Of course you can use the normal milk powder. Really looks yummy and delicious.thats spoon for me? Did you buy the milk mawa powder or did you make your own? 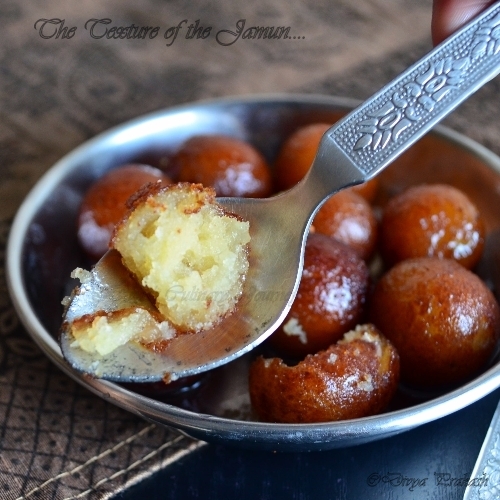 The clicks are amazing...its strange as no matter how exotc sweets we recreate and eat, we always come back t the gulab jamun and we love them a lot!!! Love the way you turned those jamuns as a new sweet, well done Divya. Btw those juicy jamuns looks highly irresistible. 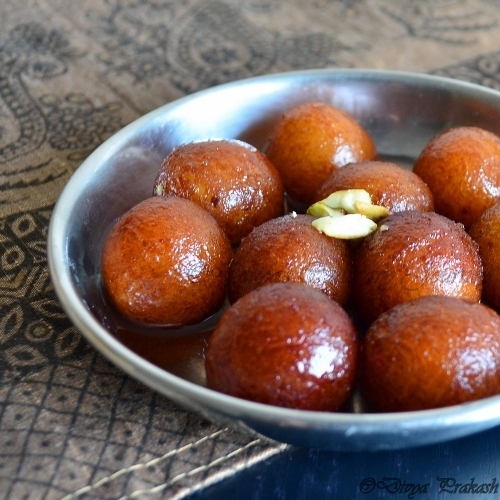 Gulab jamun are my fav..yours look so divine..yum. liked your last click dear :) wish i could have it now.. It is also one of my favorite sweet and I have tried gluten free few times but not quite satisfied yet. They really look perfectly done from inside. Good job Divya! Jamuns look perfect, makes me want some now.. I was looking for gulab jamun recipe from scratch and saw this..just one don't dear what is milk mawa powder ??? Is it sweetened milk powder ? Hi Vineetha.. Milk mawa powder & Milk powder are almost the same but milk mawa is rich and has higher fat content and the texture is different too. I got it from the Indian store here. It is not sweetened. If you don't get milk mawa powder, you can use regular milk powder too.. but if you are using non fat milk powder, the dessert may not be rich enough. Do try this recipe. This time I am sure you will get perfect gulab jamuns. 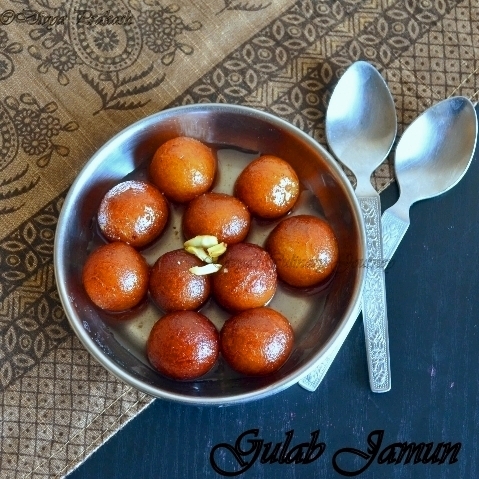 Hi Divya., I had tried many times for gulag jamun and everytime though the taste was good , I never got the perfect dough and hence the gulab jamun. 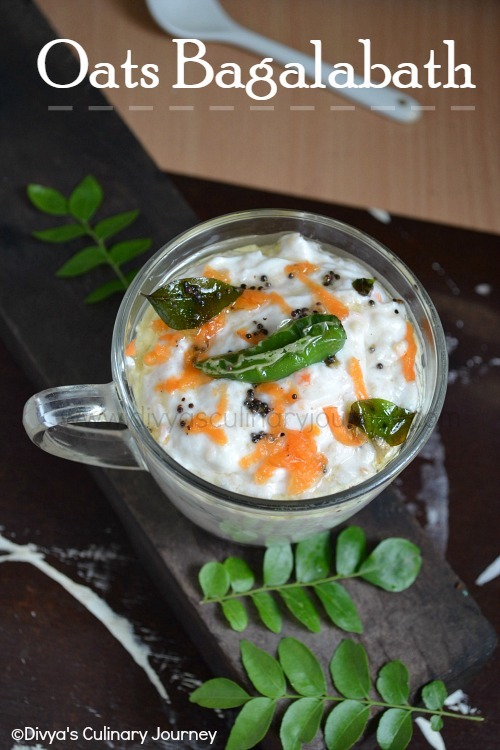 Today I tried out your recipe using milk mawa powder and it turned out fabulous. I did one more thing and that is I inserted a raisin inside the gulab jamun. I didn't have elachi dana so used raisin and it was very soft inside. Thanks for sharing your recipe.